The galleries shown below represent just some of the artifacts that tell the story of the Nevada State Prison. As we continue to grow, the section will expand. We are grateful to the many donors who provided the items or the photographs you see here. : This is the uniform of Fred Allen. Fred began work at NSP in the early 70’s, obviously as a Correctional Officer. Ultimately he became the supervisor of the Bookbindery. The uniform coat and trousers are constructed from a tough blend of cotton and wool. 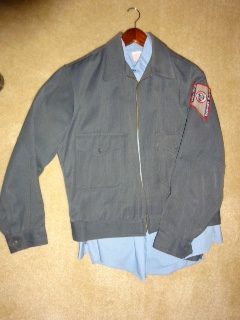 Although the uniform gave the Officers the look of a 1950’s bus driver, they were tough and long lasting. The only item missing from the uniform is a hat. Hats were generally retained by the Prison when an Officer left. We know some are out there and we are looking to complete the ensemble. 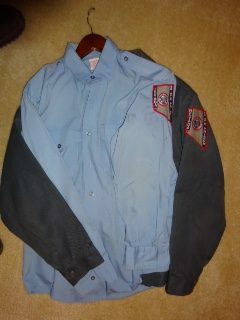 This photo shows the blue shirt that was used for the uniform. There were different fabric blends that could be purchased by Officers for the uniform. The best, shown in this photo was a ranger type shirt mad from substantial cotton material with pointed pockets and permanent creases. 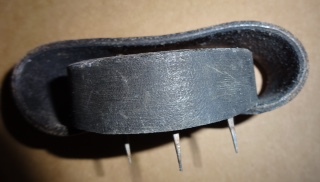 This photo shows what is typical of a “shank”. A shank is an inmate made weapon, usually crated from materials stolen from the Culinary of maintenance shops. Inmates working in these two areas would steal the raw material and sell them to inmates who wished to attack others, or defend themselves from attack. 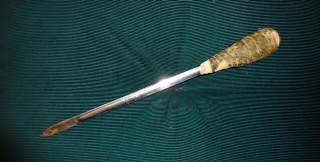 This particular shank is made from a ladle handle with a masking tape handle. These bayonet-like weapons were usually sharpened on the concrete floor of the cell-house. 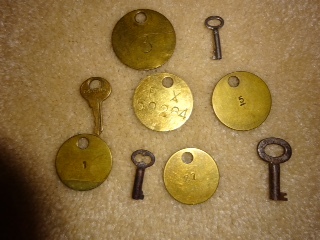 Assorted, vintage cuff keys, and brass key tags. Obviously every Officer carried a handcuff key even if they did not carry the cuff themselves. 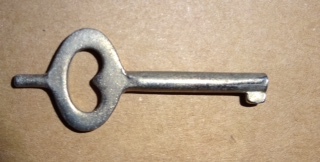 The key tags were used by all staff members who entered the yard of the Prison. A person who regularly entered the yard had their own set of tags, all with the same number imprinted on them. These tag were exchanged for a set of keys that unlocked doors in the areas of the institution to which the individual was assigned. In this manner the Control Officer could account for the staff member who had been issued a specific set of keys Tag were also used for specific hooks on which persons who were not issued keys could leave their personal keys before entering the institution. 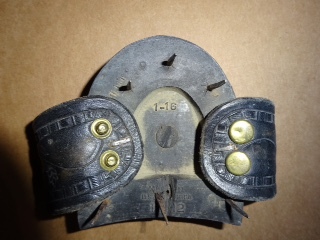 These numbered hooks made it easy for the Control Officers to retrieve the keys when the staff member departed the institution. You were not allowed to take your personal keys into the institution as car keys could obviously be an escape aid, or the other keys could be modified to attack doors in the Prison. These were donated by Glen Whorton. 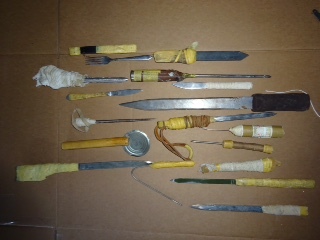 Assorted shanks denoted by Ron Parini, Sheriff of Douglas County, and former NSP investigator and trainer. This collection of shanks demonstrates the wide range of materials and construction used to craft prison weapons. One of the most unusual weapons in this collection is the wooden handle with the food can top attached. This is a slashing type weapon that an inmates attempted. Which was not well constricted and is so light that it is unlikely that it would have been very damaging had it been used. The materials used in these shanks include culinary tool handles and flat steel stolen from the maintenance shops. The handles include wraps made from wood, sheets, leather strips from hobby-craft supplies, and masking tape. “Claw” This is an unusual weapon made from the heel of a shoe, shoe nails, and a strap made from an officer’s belt. “This is gonna hurt ! !” This weapon was donated by Sheriff Ron Parini. Alternate view of a “Claw” This is an unusual weapon made from the heel of a shoe, shoe nails, and a strap made from an officer’s belt. “This is gonna hurt ! !” This weapon was donated by Sheriff Ron Parini. 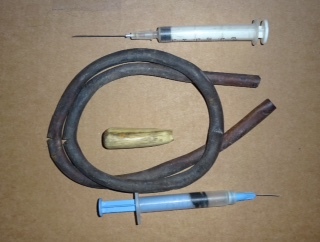 Drug paraphernalia: These items demonstrate a failure in the management of the Prison. At the time these syringes were confiscated there were inmates working in the infirmary of the Prison as medical staff. Inmates gave shots to other inmates! This was because the budget provided by the Legislature included an absolute minimum of Free, Professional Medical Staff. Someone has to do it. So inmates were trained to perform minor procedures. Indeed, there were instances of inmates pulling other inmates’ teeth between the periodic visits of a contract dentist. When used, the needle portion of the syringe was clipped off to prevent further use. Inmates have crafted, crude, new needles onto the used syringes. You have to want a fix really bad! The tube could be used to smoke, or as a tourniquet to help with an injection. 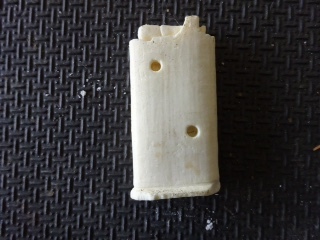 The small white item is a bone pipe used for marijuana. These items were donated by Sheriff Ron Perini. Tattoo gun: Tattoo guns were crafted from small electrical appliances to, obviously, make tattoos. Tattoo imprinting is, and was, a prohibited activity in the Prison. Demonstrate their defiance of social mores. Tattoos ranged from crude hand drawn /needle/ink, to more elaborate tats made with a gun such as this one. They were an element of the institution’s underground economy in that the artists would be somehow compensated. In later years were part of actual, inmate Parole plans in the form of opening a tattoo parlor. 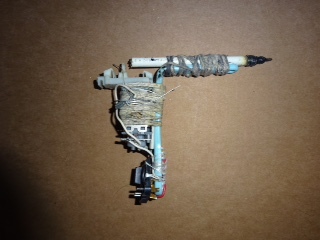 This tattoo gun was donated by Sheriff Perini. Escape Mask: This is a remarkable and unique artifact. It was to be used as part of an escape attempt. 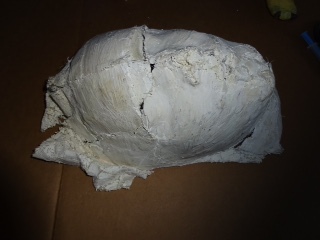 In this instance the mask was found before escape attempt. It was designed to fool Officers into thinking there was an inmate in a bed rather than loose in the institution or over the fence. When counting Officers were supposed to see “skin” to insure that the inmate was present. This mask ready to be colored to provide that skin tone. It is made from fabric and toothpaste; both item readily available to inmates. The profile of the face is very well done. It is amazing that it has survived since the 1970’s, given its fragile construction. 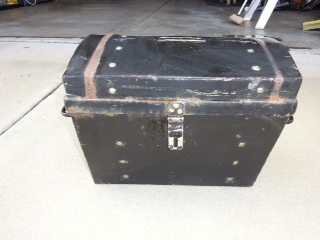 Again we are grateful to Sheriff Ron Perini for this unusual piece of history. 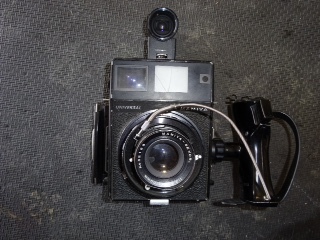 Evidence Camera - This Mamiya camera was used to document evidence and incidents at the NSP. It was used by the investigators in the institution. The documentation that it provided was crucial to criminal prosecutions and the conduct of the institutional disciplinary process. It was donated by the NDOC Inspector General’s Office. 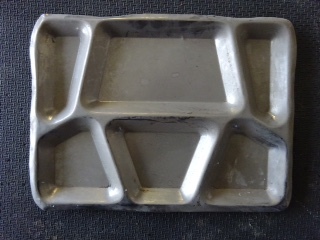 Food Tray – This food tray was used in the Mess Hall of NSP. Its compartmentalized design obviously provides separation so that your green jello does not run into your navy beans. It also meant that your food was not overly warm by the time you sat down on a cold, steel stool to eat. This stamped steel tray was easy to clean, easy to store, and reduced the number of table items necessary to feed the population. The one disadvantage to this institutional tableware became immediately clear when an inmate sailed it through the air in the direction of your head. Shotgun Barrel – This shotgun barrel was found buried near the bluff behind the staff cottages outside the NSP perimeter. The condition of the barrel would seem to indicate that it was disposed of due to damage. It appears to be a single shot 16 or 12 ga. Shotgun. We will have to undertake some research to identify its original configuration/age. 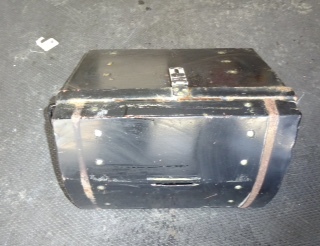 This barrel was donated by the NDOC Inspector General’s Office. 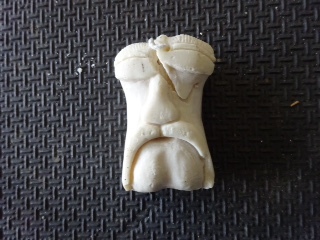 Soap Viking Head – This soap art was taken at NSP. Its subject matter would suggest that its origin is a bored Arian Warrior gang member. The soap was donated by the NDOC Inspector General’s Office. 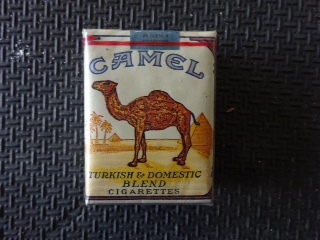 Camel cigarette package [Unfiltered] – Unfiltered Camels were the preferred tobacco product at NSP. They were preferred over the more ubiquitous, but cheaper “Bugler” tobacco rolled into a cigarette. Both items could be purchased in the Inmate Canteen using brass coins, or later brass slips [the prison equivalent of a check]. Regardless of the brand or form of the tobacco, inmates were relentless smokers. This resulted in a high incidence of lung cancer and fingertips stained by nicotine [Nasty!]. The health issues grew so profound, that several attempts were made to prohibit by the prison administration, and legislators. This usually resulted in a costly disturbance. Ultimately public smoking was limited by the Legislature, and the Prisons were required to follow suit. At that point it was not a major issue as County Jails had already banned smoking and inmates arrived in prison as non-smokers. : Kite Box? – We are not sure of the provenance of this box, other than that it came from NSP. It has a slotted top where items can be placed. It was apparently made in the maintenance shops based on the somewhat crude, welded construction. There are several probable uses for the box at NSP. The first possible use could have been for suggestions. RIGHT!! Suggestions were always welcome from the inmates. Certainly most suggestions from inmates would have been interesting, if adult, reading. The second potential use would have been for brass slips. Prior to 1967, inmates carried brass coins to be used in the canteen, and the Casino. Informing on other inmates [ a “snitch kite” ]. Alternate view of : Kite Box? – We are not sure of the provenance of this box, other than that it came from NSP. It has a slotted top where items can be placed. It was apparently made in the maintenance shops based on the somewhat crude, welded construction. There are several probable uses for the box at NSP.